“I have been enamored with Uli’s Sky Guitar since its debut on Beyond the Astral Skies. The promo video for The Night the Master Comes and the photos inside the album sleeve captivated me, as I know it did many others. Many companies tried to make a Sky Guitar, but only Elliott Rubinson and Boris Dommenget and, of course Uli, got it right. 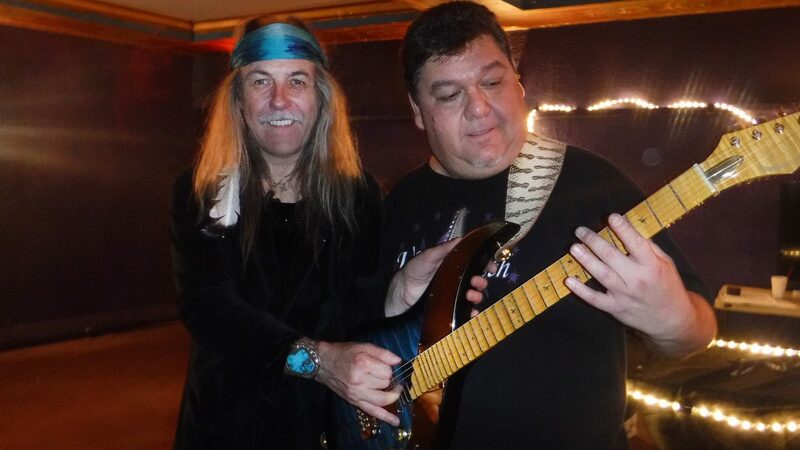 When Elliott “Dean” Rubinson debuted the new 50 limited edition Sky guitars, I had already been friends with Uli for many years, and I had found a new friend in Elliott, who I will always miss. First thing I did at NAMM was sprint to Elliott’s booth and place an order with him and Uli directly. That became the first Sky Guitar of 50, Sky of Chavez. A 7-string amazing work of art, followed up by #19, 6-string Tiger Dawn. In winter of 2017, Uli played for us using his new Dommenget Sky Guitar with delay and looper built in. Once again, I fell hard for this iteration of the magical Sky guitars. Uli then asked me a few months later if I would be interested in the new Sky Elite. I was euphoric about this prospect. The previous two Sky Guitars are a joy to play, and for me, the 6-string especially. Having played Malmsteen scalloped Strats for years, I was quite comfortable with scalloped necks. It just takes a bit of adjustment, but the results are unique and worth the” learning curve” of fretting scalloped necks and utilizing the extended fretboard range. The looper effect is a very useful device as it allows one to play a “backing track”, counterpoint and harmonies instantaneously. The delay a nice “carbon copy” type that is also very useful and pleasing to the ear. These are not just guitars, they are a musical, playable work of art. The extended range make playing a piece such as Paganini’s 5th caprice possible in Violin range note selection, even though I like to play the piece in a somewhat “normal” guitar range, but still in the key of A minor, as well. You can do both on this guitar. You are not limited by the normal guitar instruments range.